St Neots Plantation Shutters by Just Shutters! The beautiful town of St Neots is steeped in heritage and history, and with that comes an eclectic mix of properties. From the old traditional homes, to the more contemporary dwellings, whatever your home, you can be sure Just Shutters have a stunning Plantation Shutter style to suit your lifestyle. Shutters are superb for the more contemporary home, they are clean, crisp and offer a unique designer look to any window. They enhance the feeling of space in a modern property. Allowing the light to flood in, opening fully for a window unencumbered by fabric. 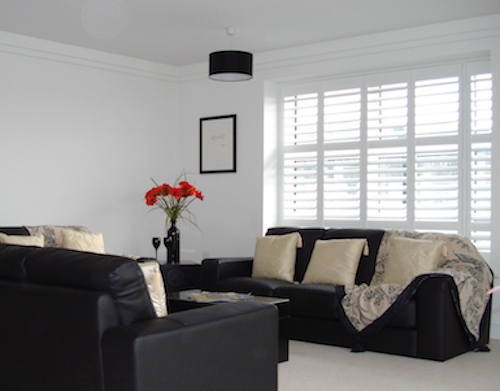 Bright white shutters look great in modern spaces. Or be bold and daring by adding a splash of colour to your windows – from a hint of pastel, to pillar-box red, a modern home can take a statement shutter and make the very most of it’s beauty. Just Shutters have an impressive history of fitting the most beautiful, tasteful and stylish shutters to traditional properties. From a sympathetic real wood shutter, to a brilliant large shaped window in the eves of a barn conversion we really are the experts who will meet your needs and desires with innovation and sympathy. For further information about St Neots Plantation Shutters and our company, please give us a call on 01223 632887 for a personal service, your local shutter expert can give you all the help you need from design to installation, and any support you may need beyond. You may like to browse our shutter galleries or request a free shutter brochure for more information and inspiration. We will be so delighted to answer any questions you may have.